On January 29th through 30th, the GEARS engineering group presented at the Arkansas Project Lead The Way Conference held in Russellville, at Arkansas Tech University. At this conference, they discussed their journey, as a group and as individuals through the engineering curriculum. 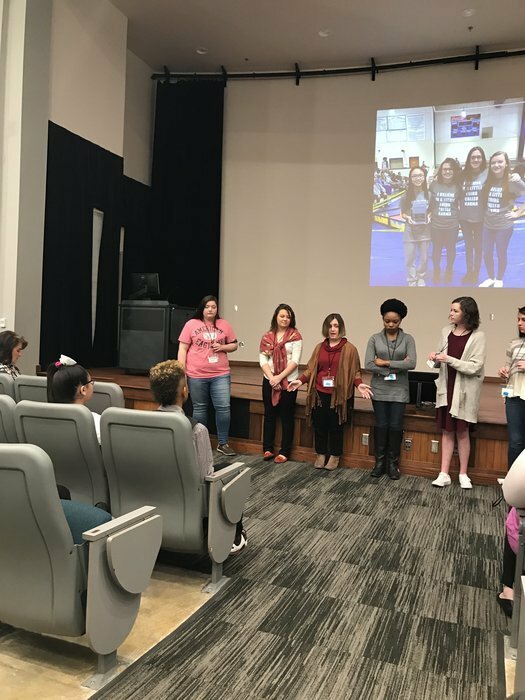 In this presentation, facilitators across the state engaged in conversation with the girls, asking questions, taking advice, and learning from their presentation as a whole. All of the girls enjoyed sharing with others and loved answering everyone’s questions. Everyone took something back from the conference that’s helping them grow even more. Who and what is GEARS you might ask? GEARS is an acronym for Girl Engineers Affecting Real-world Situations. This group is an all girls group in which they apply their engineering skills to help others. They do many different projects (big and small) throughout each year. Some of the projects include repurposing furniture, crocheting baby beanies for hospitals, designing, and much more. This group is a place for girls with an interest in engineering to share ideas. The GEARS group was formed at the beginning of the year. Currently, there are 14 girls enrolled in engineering classes and six active members in the club. Since this group was formed, they have presented at two different conferences along with their facilitator, Mrs. Chambliss. GEARS has allowed each of these girls to grow stronger in their passion for engineering. They have learned many new things, including how to use power tools and how to re-purpose old furniture. Engineering skills learned in class are applied to everything the girls do in the club.